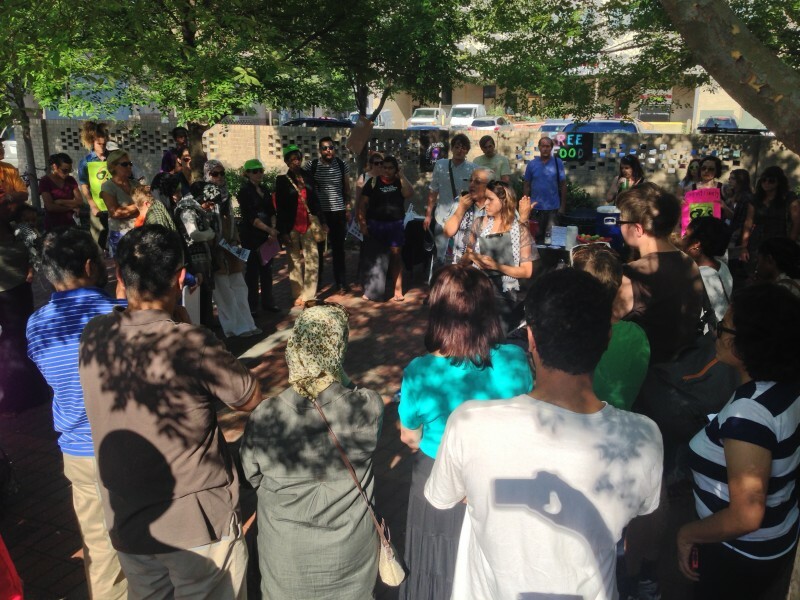 Over 200 protest in Durham, NC in solidarity with Palestine | Fight Back! Durham, NC - More than 200 people rallied and marched in downtown here, July 23, to protest the Israeli occupation's assault on Gaza and the people of Palestine. A statement from the protest organizers noted, "This most recent Israeli assault on Gaza continues to escalate and the death and casualty numbers continue to rise in a Palestinian territory that has been under a state of siege, including a blockade on building materials and other basic supplies, since 2006." The statement continued, "We believe that Israel is committing mass murder against all people living in Gaza, using killing as a tactic of ensuring the power of the Israeli settler state and the occupation of Palestine." The rally kicked off with rousing speeches from activists and moving testimony from Palestinians whose families have been affected by the ongoing Israeli attacks on Gaza. The rally was held in the busy Five Points intersection in Durham, so hundreds of passersby heard the speeches and saw the demonstration. A petition to demand justice for Palestinian activist Rasmea Odeh was circulated; many people took "Support Rasmea" pamphlets home with them and activists expressed their solidarity and support for the campaign. After the rally, a vibrant, loud march kicked off through the streets of downtown, with protesters chanting "Free, free Palestine!" and "Gaza, Gaza don't you cry, Palestine will never die!" The march went to the downtown public library, where speeches were made demanding that Durham county cut ties with G4S, a British private security company which plays a key role in Israel's occupation of Palestine. Durham County has a $1 million contract with G4S. A campaign is currently underway calling on Durham County to join the global Boycott Divestment and Sanctions movement by not renewing the contract with G4S. From there, the march proceeded to the downtown jail. As prisoners tapped on their windows in support, organizers spoke about the repression visited on Palestinians and the struggles to end repression of oppressed nationalities here at home. The Durham protest is the latest in a wave of actions here in solidarity with Palestine in recent days. Three protests have been held in Carrboro, Durham and Raleigh over the last five days and on July 25 two vigils will be held in Durham.